SAN DIEGO (KGTV) - On a hot Wednesday afternoon, Stephanie Fulmer sits in the shade at Balboa Park. Her 5-year-old daughter plays nearby while her newborn is fast asleep in his stroller. "This is Ezekiel," said Fulmer. "He's laid back! Especially compared to his sister, she was a hot mess and all over the place!" Fulmer says Ezekial completes their family, but she admits they had only planned to have one child. "If we had more money, we'd have more kids," said Fulmer. Now she and her family are questioning whether they can continue affording to live in San Diego. According to the United States Department of Agriculture , it costs about $233,000 to raise a child from birth to age 17. Housing is the most costly expense, followed by food and childcare. That $233,000 figure does not include pregnancy costs and college tuition. In some cities with rising home values, birth rates are actually going down and researchers believe there's a connection. According to analysis from Zillow , San Diego home prices rose 34 percent from 2010 to 2016, while birth rates among 25 to 29-year-olds dropped 19 percent. Nationwide, birth rates have dropped steadily since the 2008 Great Recession. Economist Erik Bruvold believes the trend will have a negative impact on our country in the long run. He says fewer children means a shrinking workforce. "We've got a really big bubble of seniors moving through the demographic chain, they are going to need workers and taxpayers supporting them as they grow into old age," said Bruvold. Bruvold says it's necessary to maintain population growth to sustain safety nets like Social Security and Medicare. "We probably need to have some serious conversations about how to make child-rearing more affordable," said Bruvold, "Whether that means additional childcare, increasing the housing supply." Bruvold says it's a concern among all developed countries. "One of the good things about having a system more tolerant to immigration is it creates a growing workforce that we really need to support those aging baby boomers that will put a strain on the system," said Bruvold. 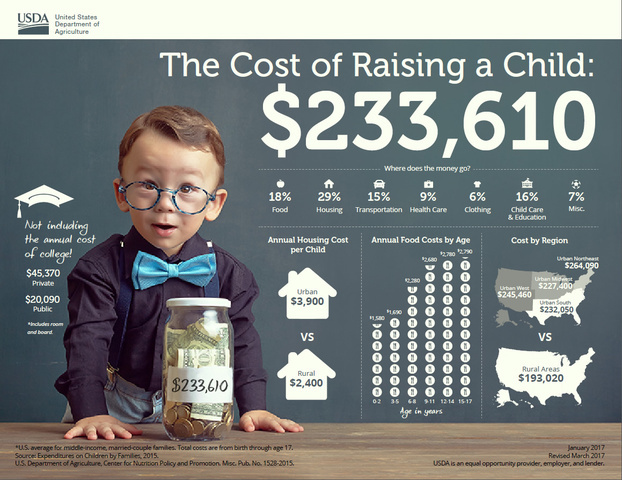 With the USDA's 'Cost of Raising a Child Calculator ' you can calculate how much it will cost per year to raise a child. It can help families plan better for overall expenses including food, or to purchase adequate life insurance.